Bad news: The U.S. Court of Appeals dismissed a SEMA-supported lawsuit challenging the US EPA’s authority to permit 15% ethanol-blended gasolines. The U.S. Court of Appeals dismissed a lawsuit which challenged the Environmental Protection Agency’s (EPA) authority to permit 15% ethanol (E15) content in gasoline for 2001 and newer model year cars and light trucks. Over a year ago, the EPA raised the amount of ethanol permitted in gasoline from 10% (E10) to 15% (E15). The agency has approved applications to sell the fuel and it may soon appear at a gas station near you. SEMA opposes E15 based on scientific evidence that it causes corrosion with incompatible parts. In light of the court’s decision, SEMA is now seeking passage of congressional legislation (H.R. 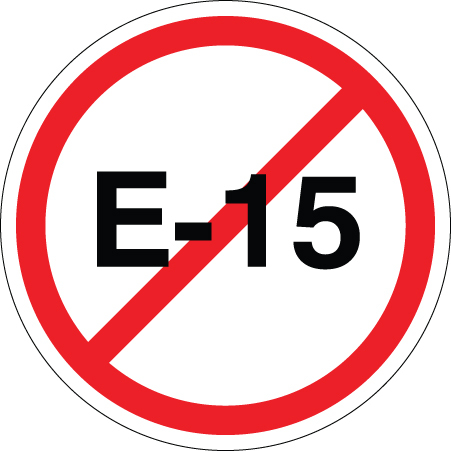 3199) that would prevent the EPA from permitting E15 sales until the National Academies of Sciences have conducted a study on how E15 may impact gas-powered vehicles. The bill has been approved by the U.S. House of Representatives’ Science Committee, and is pending on the House floor. With little time to address the bill before the fall elections, it is important that lawmakers hear from you on this important issue. We Urge You to Contact Your Members of Congress to Request Their Support for H.R. 3199! •The EPA permits ethanol in gasoline to be increased from 10 percent (E10) to 15 percent (E15). Ethanol increases water formation that can then create formic acid and corrode metals, plastics and rubber. Older cars and certain high performance specialty parts are not constructed with corrosion-resistant materials or able to tolerate the higher temperatures at which E15 may burn. •The EPA has acknowledged the dangers and made it “illegal” to put E15 in pre-2001 vehicles. However, the EPA is willing to risk destruction of the vehicle/parts by relying solely on a gas pump label cautioning motorists not to misfuel their older vehicles. The EPA estimates that there are 74 million such vehicles in harm’s way, along with millions more boats, lawnmowers and other gas-powered engine products. •Many auto enthusiasts have complained for years about damage caused by E10, which is now in over 90% of gas sold in the U.S. For example, corrosion has time to damage the engine, fuel line, fuel tank and exhaust systems when classic cars are infrequently driven. E15 increases the risk of corrosion by 50 percent. •The EPA permitted the sale of E15 before there was conclusive information with respect to materials compatibility, tailpipe emissions and fuel efficiency. •H.R. 3199 would stop the sale of E15 until the National Academies of Sciences have conducted a study on how gasoline blended with 15 to 20% ethanol may impact gas-powered vehicles. DON’T DELAY! Contact your members of Congress immediately by phone or e-mail to request their support of HR 3199. Please e-mail a copy of your e-mail to Stuart Gosswein at stuartg@sema.org. To discuss this topic, visit the discussion forum thread by clicking here.